Nothing can satisfy a growling stomach quite like a burger. The Counter Custom Built Burgers takes an American classic and kicks it up a notch, giving customers the ability to create a gourmet burger tailored to their particular taste. After customers are seated, the server brings out a clipboard and pencil for each person at the table. Attached to the clipboard is the restaurant menu, and the customers are expected to build their own burger by following the steps and checking off a variety of options. The first step to the ordering process is choosing a type of burger. The Counter offers beef, turkey, veggie and grilled chicken burgers. Next, the customer is required to choose the size of the burger. The burgers come in three sizes with the smallest being a one-third pound patty; the middle-sized burger is two-thirds and the largest is a one-pounder. The Counter offers 10 different types of cheeses to pick from and 28 different toppings ranging from dried cranberries to roasted chilies and beyond. The menu then advises the customer to select one of 18 sauces and to choose a style of bun out of three options: an English muffin, hamburger bun or honey wheat bun. Any burger can also be prepared in a bowl. Instead of ordering a bun with the burger it comes on top of a fresh bed of lettuce. 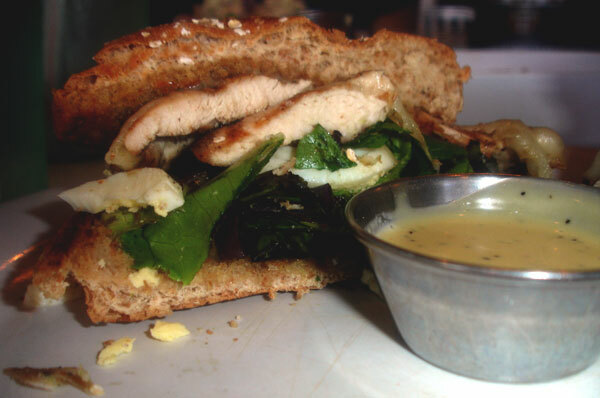 I built a grilled, one-third pound chicken burger on a honey wheat bun with sharp provolone cheese, hard-boiled eggs and mixed baby greens with honey mustard sauce on the side. The chicken was very tender and the fresh mixed baby greens gave my burger the perfect crunch. I was being daring in adding the hard-boiled egg slices, but they ended up complementing the other ingredients well and added a unique twist to the burger that made it taste that much better. This burger came out to $8.50. Then I sampled the Maryland-style lump crab cake burger, and the taste was immediately pleasing. The crab cake burger was piled high with coleslaw and the crab was slightly crunchy on the outside, soft on the inside and perfectly seasoned. Although this dish was $14, it was worth the cost because the bed of lettuce the burger sat on could be compared to a large side salad. When ordering, keep in mind what toppings are going to be on your burger. It’s possible to create a delicious signature burger, but it’s also possible to construct a disgusting mix of flavors that could potentially ruin a meal. The burgers are not the only item on the menu worth tasting. The “fifty-fifty” starter offers three different choices to choose from: fries and sweet fries, fries and onion strings, or sweet fries and onion strings. The sweet fries are a unique twist to a common appetizer that almost taste like they could be a dessert. An order of fries and sweet fries served with horseradish mayo, giving an extra kick of flavor, cost $5.25. Another innovative starter is the Fried Dill Pickle Chips served with apricot sauce for $4.25. The idea of fried pickles may sound questionable, but I recommend trying this popular appetizer even if you don’t like pickles, because they don’t overpower your taste buds at all. The combination of a lightly breaded pickle slice dipped in a tangy apricot sauce is a success. Don’t forget to order a shake off the menu before asking for the bill. The birthday cake shake for $4.95 comes topped with whipped cream. The shake is the perfect consistency, creamy and rich, but smooth enough to be sipped easily from a straw. The Counter also has an extensive wine and beer menu. This restaurant is an appropriate place to go for a date, hang out with friends or take the family. The casual atmosphere is friendly to all ages and the servers are knowledgeable and efficient. My mouth watered when i saw the picture! I’m definitely going to go try this place out. It sounds so interesting!